Finesse fishing is all about presentation. Some people think it’s about the gear you use such as ultralight setups. However, the style of gear is meant to help in the presentation to get the stubborn fish to strike when they ignore the larger baits. 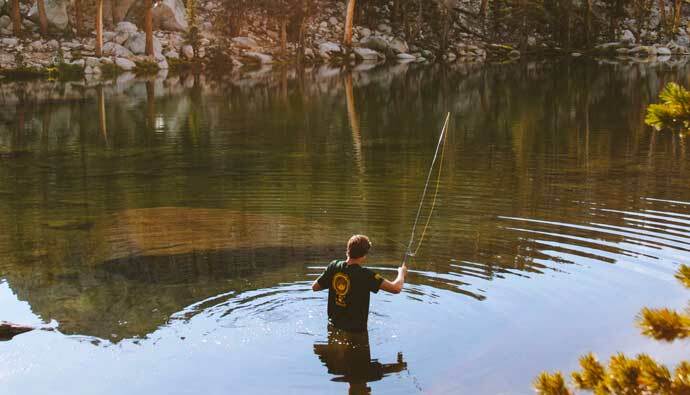 Finesse fishing is about presentation, not just using lighter tackle and gear. If you’re dealing with fish pressure and your larger tackle isn’t working…give finesse fishing a shot. It could just salvage a bad luck day. Also note, there is a common misunderstanding that finesse fishing only catches small fish. That’s a joke and you should know that large bass and other species have been caught using finesse fishing techniques. The fish can be ignoring your regular baits for a host of reasons. Maybe there’s a cold front moving through, or too much fishing pressure has the fish scared off, or maybe the water is clear to the point that they see your larger lures too much that their instincts tell them not to bite. There are many setups you can go for but one thing that’s common across all setups is a lighter leader to make it harder to detect. You might choose to go full fluorocarbon or braid with a flouro leader, but the main point is to make the line hard to see for the fish. Power fishing can be looked at as covering a bunch of water during your session looking for a reactionary strike from fish. Finesse fishing is about presentation and making your lure look more like a natural critter to have the fish swallow it up for food. This makes sense of why both methods are useful and should be used when the other isn’t working during your outing. There are a host of factors that could make fish wary of power fishing techniques and would rather strike your finesse fishing techniques instead. One of these factors includes the type of body of water you’re fishing. If your fishing a river, for example, the moving current warrants a power style of fishing. Lakes, on the other hand, are ideal for both methods due to the slower water. The gear is different between the two methods. If you’re power fishing you’re likely to use a heavier setup. 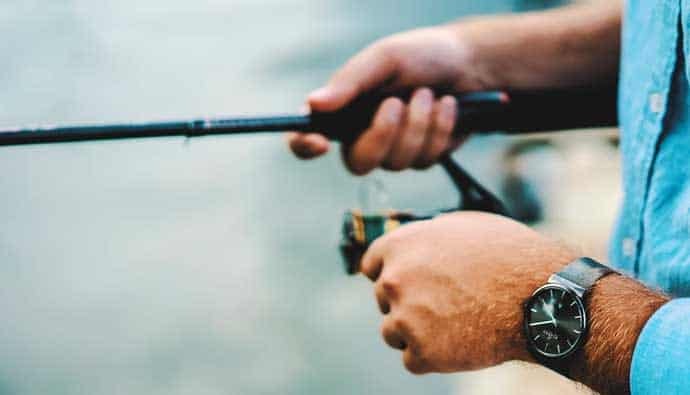 Lighter rod and reel choices for finesse fishing could lead to more lost fish and broken leaders, however, the thrill of catching a larger fish on light tackle is thrilling. If you’re using scented lures, finesse might give you an advantage because it allows the fish attractant to cover a greater distance in the zone your hook is. 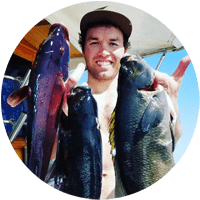 Whereas, if you’re power fishing and covering a lot of water, the attractant is only in the immediate zone your lure is when you’re reeling in. In this section we’ll be covering the proper finesse gear you need to get started catching more fish. The rule of thumb is to use lighter gear across the board. That means a medium-light rod (shorter than 7’ depending on where you’re fishing), smaller reel, and lighter pound test. Since finesse fishing is a method, you can use any style of gear that suits you. However, the most common will be a spinning rod and reel, but a close second is the various fly fishing setups. I’ve seen articles in the past where guys throw on a micro finesse lure on their fly line during colder months to try and catch trout and bass on the bottom. There are no limits to the creativity you can come up with as long as you’re getting results. Below are some great finesse bass fishing rigs. The best finesse fishing rods depend on what you’re going after. If you’re finesse fishing for bass then go with a 6’ to 6’ 9” medium-light to medium action rod. That should give you enough length to get your finesse lure into the right spots and sensitive enough to know when you’ve landed a strike. When it comes to finesse with a fly rod, nothing comes close to a Tenkara rod. These rods were popularized by the Simple Fly Fishing book from Patagonia founder Yvon Chouinard. This style of no reel fly fishing started in Japan and was perfected. Imagine a telescopic rod that goes from less than a foot all the way to twelve or more feet in length. Then you simply attach your leader and fly to the tip of the rod and start fishing. The long rod helps you get to hard to reach places and without the extra fly line, there are no worries about tangling or snagging. The spinning reels that work best are 2500 to 3000 size reels. They are large enough to prevent wind knots and other annoying tangles that come with smaller reels running fluorocarbon. Since we talked about Tenkara rods, it’s only fitting we talk about spinning rod and reel setups next. If you want a rod that gives you finesse necessary to catch trout, stick to a medium light rod around 5’ to 5’6” in length. These can be hard rods to find in the States. Most rods are in the 7’ range, which is good for lake fishing or standing on the banks of larger rivers. But, if you want to fish smaller streams for trout, it’s better to get a shorter rod and high-quality spinning reel. You’re going to need to pair that to a reel that gives you the ease and sensitivity required. I’m personally a fan of Japanese rods for spinning reels that require finesse. Daiwa and Shimano both make excellent reels especially in the 2500 size spinning reels recommended for most finesse fishing. In the states, these are hard to find. In Japan, they are everywhere, but we’re not given access to quality finesse baitcasters here. Don’t get duped with the cheap “ultralight” style baitcasters here. They won’t give you the same quality experience that a better Daiwa or Shimano spinning reel will give you. You could take a quick trip to Japan and grab a nice one though! If you’re having trouble catching fish, then it’s time to pull out the shaky head rod and reel setup. It’s just a jig head or what some people call the jig worm. A popular worm to throw on the jig is a four-inch ocho. Throw the jig hook through the tip of the worm and drive it through until the barbs catch. Then embed the hook barb into the worm. When the jig is on the bottom there is nothing for it to catch and snag and it’s sending the worm tail straight in the air like a delicious meal. Everything should be on like rods and line. Opt for medium-light shorter rods and a 2500 size or smaller reel using four to an eight-pound test fluorocarbon leader. Many anglers user braid on the reel to get you extra sensitivity while fishing. When the bait is on the bottom hold the rod lightly in your hand and give it a slight shake. Keep doing it until the bass swallows the bait up like a vacuum. Then set the hook. When it comes to finesse rigs there are some tried and true workhorses you should know about. First, start with the plastics. Four-inch plastic baits such as grubs, worms, crawls, tubes, and any other smaller type of soft plastics will get the job done for finesse fishing. You can even go smaller if you wanted to try some micro finesse methods if you find that the four inchers aren’t doing the job. Most time you’ll finesse fishing rigs using a Texas Rig. This places the hook point into the lure to act as a weed guard so you can rest and bounce the lure off the bottom. You’ll want to let the lure slowly sink to the bottom then do a slow twitch and a slight reel in the line and let it sink back down. It should look like a slow-moving up-side-down U shape in the water over a distance. A lot of people ask me how to fish a finesse worm. There are many styles, but one of my favorites is using the Slipshot Rig. What’s nice about this rig is that it makes your lure look like a tiny fish swimming through the water. Some say that it’ll make any bass, even the unhungry ones bite. Throw a 4-inch curly-tail worm (great for finesse worm fishing) or a 3-inch grub on a straight shank Aberdeen style hook and give yourself 18 to 24 inches of 6-pound test and hit the water. 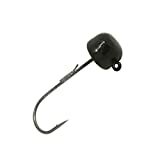 The hook sticking out will act as a keel that will keep the lure straight in the water like a missile looking for is a target. Now you have a finesse worm rig to try! If you’re having trouble with one lure or bait, then there’s no reason not to try two. Double the fun! A popular setup is using a jig-n-pig at the end of your line then attaching ANOTHER leader to a hook and a soft plastic bait. Use about two to four feet of leader for the second bait and now you’ve given fish multiple options for biting. Eurotackle makes a great soft swimbait called the B Vibe. It’s a paddle tail lure that has a ribbed body and a slender tail that gives it great movement in the water. The B-Vibe is a great micro finesse lure that creates a solid finesse jig trailer setup that is sure to catch you more fish. Micro finesse fishing is in a league of its own. It’s popular in Europe but is making it’s the way to the States. Let’s talk about why it’s becoming so popular. Micro finesse fishing is relatively new and is the process of using ultralight equipment and jigs to catch stubborn fish that aren’t biting. The way to get the fish to bite is to present them an action that sparks their attention. Depending on what you rig up you can present something that looks like a crawfish or even a bug in the water, heck it might even look like a bluegill. The best time to use this setup is when you’re fishing in high pressured situations, super clear water, or just when bass or your target fish just won’t strike those larger baits. It’s not depth dependent, but it’ll shine in shallower rocky areas that give other setups trouble. When it comes to the micro finesse gear, ultralight reigns king. You’ll want a 7-foot medium to medium light spinning rod paired with a 500-1000 size reel and 2-4 pound fluorocarbon line. The fluorocarbon will give it that nice hidden line presentation and the lighter gear will give you the sensitivity necessary to get the proper presentation. Anything bigger and you will have difficulty making longer casts! Backwoods Bait and Tackle makes a few styles of micro finesse lures that are sure to help you catch those stubborn basses, walleye, pike, and other fish. It’s important to make sure the plastic is strong and durable so you don’t have to replace the lures often. Backwoods uses an extra robust polymer that’s rated for longer durability. They were formulated like this after the owner got sick and tired of crappy store-bought lures. If you want to give a higher-quality micro finesse lure a shot, check out Backwoods Micro Finesse Lures. When it comes to micro finesse jigs, especially bass finesse jigs, the ZMan Shroomz is a great option. The Z Man jig heads come in a mushroom head design with small thin skirts and a weed guard. They come in around 3/16 – 1/8 ounce sizes. They are usually paired with a 2-inch lure such as a crustacean plastic that helps make the setup more attractive to the bass. Eurotackle has been popular in Europe for some time now making super small lures in various critter shapes. They like to say that even in small packages they still have large actions. They use extra soft plastics that are still durable. These have become extremely popular with ice fisherman as well. Unfortunately, since they’re based in Europe, it can be hard to get them in the states. Luckily, Backwoods Lures has improved on their design and has started offering them stateside. If you’re looking to try some of these micro lures, be sure to check out Backwoods before your next ice fishing adventure. No matter which rig you choose if you don’t know where the fish are it won’t matter. Know the seasons, know the water conditions, know the fishing pressure, and be creative to get the lures and baits to where the fish are and with the presentation they need to see to bite consistently.